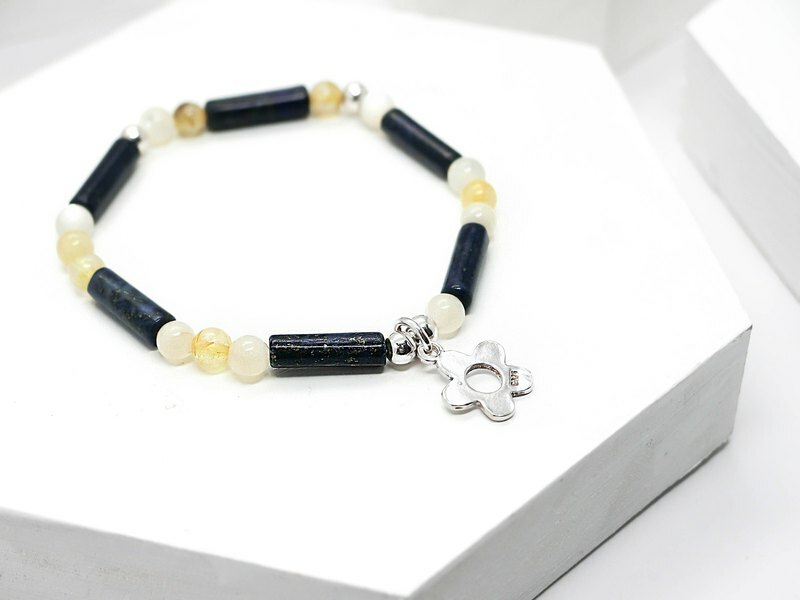 Flexible beaded bracelet Beaded bracelet 4mm stone (Lapis lazuli, Beads, Blonde), 925 sterling silver, Tibetan silver With paper bag*1, box*1, intimate small card*1, product warranty card*1, maintenance wiping cloth * 1 <Blue sky and white flowers> Elegant color Wear a youthful temperament Package diagram: https://farm5.staticflickr.com/4751/26680305378_34ff0a2a3d_k.jpg https://farm5.staticflickr.com/4607/25680655567_9679a99171_k.jpg https://farm5.staticflickr.com/4618/40551473031_cec5b9d3e4_k.jpg https://farm5.staticflickr.com/4671/25680649007_098f2a4ebe_k.jpg -------------------------------------------------- ------ Hand circumference size measurement method: 1. With a thin line around the wrist thinnest around, do not over-tension or relax, and measure the length can be. 2. If you like to wear the tightness, then please indicate to inform the designer. 3. Commodity size restrictions: measuring the total length of 12cm ~ 20cm 4. Be sure to ask the designer for any length of doubt. Material use: 1. bracelets are used # Japan elastic silk line. 2. Natural stone surface may have ice cracks or mineral lines, the other part of the design museum has been optimized for natural stone, each stone is not the same degree of optimization, if mind those who please a lot of consideration, if not acceptors do not Oh! 3. Commodity metal fittings are used 925 sterling silver, Tibetan silver or solid brass. Precautions: 1. Metal beads with beads may be worn because of magic wipe and collision and produce a slight scratches and metal oxide marks are all normal, do not worry. 2. Natural stone will be due to long-term wear or wear when the collision and damage its surface light, is a normal physical phenomenon. Use and maintenance methods: 1. Metal parts need regular wiping cloth regularly wipe and maintain. 2. If the metal parts for the 925 silver, do not bring hot springs to prevent metal sulfide black. 3. Some natural stone hardness is not high, should pay attention to fall collision situation, to prevent natural stone fragmentation. 4. Clean items are alkaline or acidic erosion of chemical composition, it is not recommended to take a bath or swimming wear. 5 usually do not wear, available wipe the product wipe, housed in the box. After-sales service: 1. Products are handmade products, no return or replacement service (except for defective products). 2. Each product enjoy a few days free to modify the length of B times the opportunity to pay the freight on their own. 3. If the need to reconnect the goods after the break, the original bracelet beads and metal parts to be returned to be charged 100 yuan finishing fee, if the length of material missing will be calculated as the proportion of the cost of goods as materials and freight Need to pay on their own. 4. If the product due to long-term wear to do cleaning or replacement of natural stone, need to charge a finishing fee of 200 yuan, the replacement of materials in the proportion of the cost of the commodity as a material fee.